The Window Jumper cable is very thin, ultra-low loss RF coax jumper cable desinged to allow you to connect the outdoor aerial to your repeater unit through a window edge without drilling through the wall. This is a convenient option for people in rental units or listed buildings where drilling is not an option. 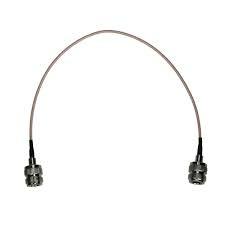 The window jumper cable is exteremly low-loss and will have negligable effect on signal loss to the repeater unit. This also comes with 5M cable with connections to connect from Window jumper with connections.